Want more information? Look here for a more in depth review. Renowned energy scientist Bejan (Mechanical Engineering/Duke Univ. ; co-author: Design in Nature, 2013, etc.) reorients the query “what is life” within the perspective of physics. Founder of the “constructal law,” which holds that “power and dissipation conspire to facilitate all movement on earth, animate and inanimate, animal, human, and machine,” the author elegantly argues that evolution transcends the boundaries of the biological and governs the flow of all phenomena. 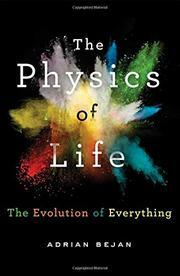 His theory both reorients how we think of physics, shifting focus from the effect of the individual to a necessary entanglement of the whole, and also empowers us to consider “life” as all manifestations of forward flow. From this perspective, Bejan analyzes such myriad subjects as athletics, technology, migratory patterns, and even the ice volume of snowflakes to prove his point—which he does well and often throughout the book. In compelling and mostly nontechnical language, he argues, “the live system has flow, organization, freedom to change, and evolution.” From this, agency derives power, and from power comes movement, a symbiosis that is the manifestation of the “life laws” of physics in living and nonliving things. While it may take a careful rereading of certain chapters to truly grasp the author’s novel unifying theory, it is worth the effort, as his book-length proof is at once riveting and poetic. Rarely are scientists capable of translating esoteric concepts in such broad strokes without losing coherence, but Bejan’s persistent focus on the details brings the constructal law to life via the everyday. In the end, his blend of science and the philosophy of design (among other disciplines) is convincing and may just shift your perspective of self. Unique and entirely fascinating, this book will linger in your consciousness and prompt you to look at the world with fresh eyes.